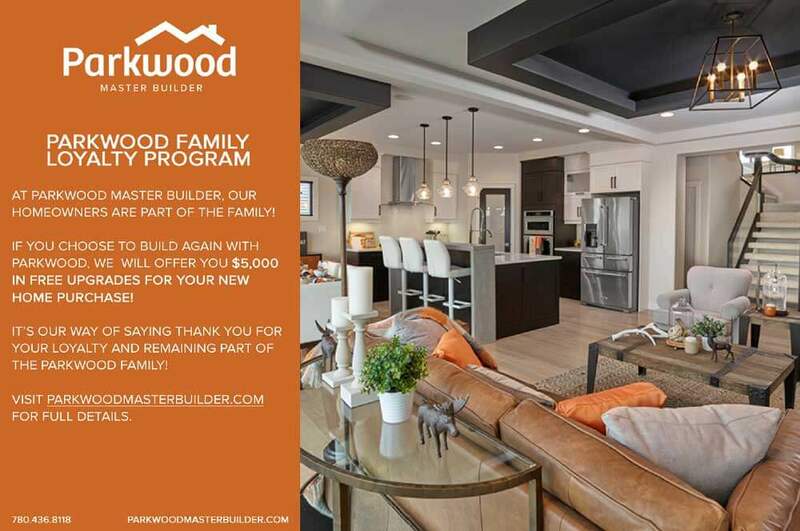 At Parkwood Master Builder, we pride ourselves in providing our homeowners with the ultimate personalized home buying experience and we also believe in offering the full package. Here are just a few of the Parkwood Perks offered to our homeowners! Your referral is the finest compliment. 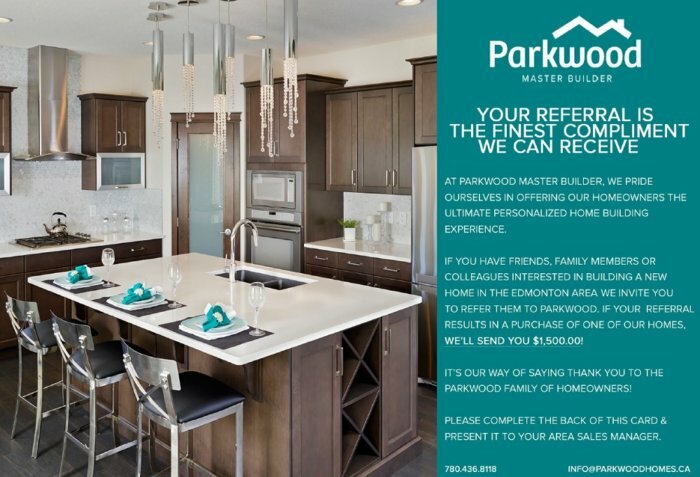 If you have friends, family members or colleagues interested in building a new home in the Edmonton area we invite you to refer them to Parkwood. If your referral results in a purchase of one of our homes, we’ll send you $1,500.00! Should your friend purchase a home, $1500.00 will be sent to you! It’s our way of saying Thank You to the Parkwood family of homeowners! T&Cs: Some conditions may apply. The Parkwood Group of Companies reserves the right to modify or discontinue the Parkwood Referral Program without notice. At Parkwood Master Builder, our homeowners are part of the family! If you choose to build again with Parkwood, we will offer you $5,000 in FREE upgrades for your new home purchase! It’s our way of saying Thank You for your loyalty and remaining part of the Parkwood family! 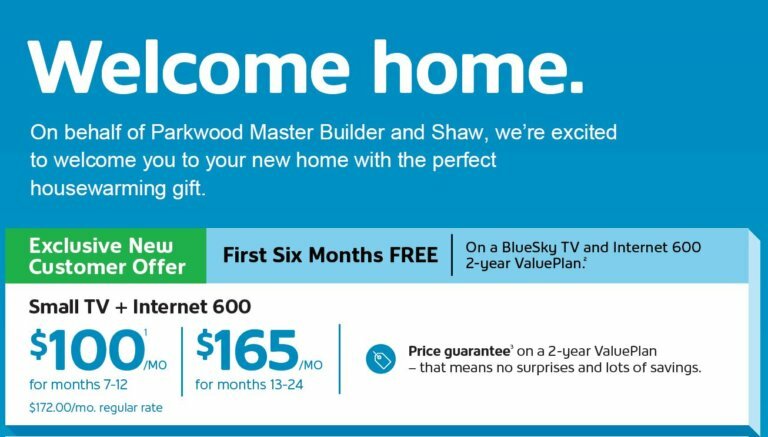 As a Parkwood homeowner, you’ll gain exclusive access to Shaw home services, including your First 6 Months Free of BlueSky TV and Internet 600! BlueSky TV is voice powered and allows you to speak to your remote, while Internet 600 features 600 mbps download speed and unlimited data. Welcome home from Parkwood and Shaw! Ask your Area Sales Managers for full details. You could save $8,000 or more in Listing Fees! Our Realtor Partners are committed to selling your house for top dollar. Contact us today for more info! Refer yourself or your friends to one of Parkwood’s Realtor Partners and receive our Realtor Friends & Family Discount of $1,500* off their professional realty services. Sell your house with the knowledge and expertise that only comes with a Realty Professional and save with Parkwood! Ask your Area Sales Manager for more information on how to connect with our Realtor Partners! * No purchase necessary. Discount provided by Realtor Partner and should be reflected on your listing agreement.